The Mousetrap is the longest running show in the world and celebrated 65 years on London’s West End in 2017! The play is a classic murder mystery by Agatha Christie, and opens with the murder of a woman played out onstage. The main setting of the play is the imposing Great Hall of Monkswell Manor. Guests of the manor are snowed in and displeased with the general situation. As a guest is killed, suspicions are raised and each person at the Manor becomes a suspect. The show boasts an interesting plot twist for an ending, which audience members are asked to keep a secret! The Mousetrap is a classic classic “whodunnit” that is perfectly executed, keeping audience on the edge of their seats night after night. Come and find out what gives this giant of a show such enduring power. The box office is located within the theatre building on West Street and is open Mondays to Saturday from 10am to 8pm Pre-purchased tickets can be arranged for collection at the theatre’s box office within the hour before the show starts. If you plan to collect your ticket you will need the card you used to make your purchase along with your booking reference. Originally designed by W.G.R. Sprague, St Martin’s Theatre is a pair with the nearby Ambassadors Theatre. First opening in 1916 with musical comedy Houp La!, the theatre was under a 21-year lease with theatre impresario Charles B. Cochran. Early notable productions included Damaged Goods (1917), A Bill of Divorcement (1920), R.U.R. (1923), starring Basil Rathbone, Meet the Wife (1927), The Green Bay Tree (1938), The Shop at Sly Corner (1945), Guilty Party (1961) and thriller Sleuth (1970). 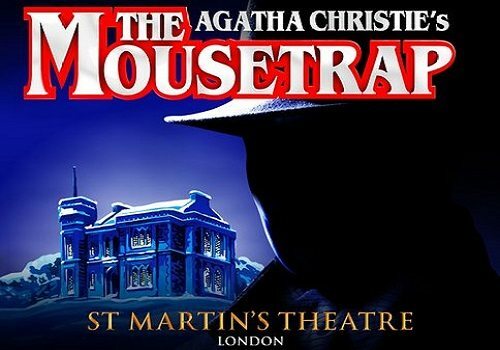 In 1974, Agatha Christie’s murder mystery The Mousetrap opened at the theatre, after a previous 22 years at the Ambassadors Theatre. Since then, The Mousetrap has become the West End’s longest-running play, exceeding 25,000 performances at St Martin’s Theatre.